Last weekend when Alison and I stayed at the Lark Hotels property in Narragansett, RI — The Break Hotel — we got the opportunity to meet their Chef Basil Yu at Chair 5 and partake in a little cooking class. We walked in not knowing what we were making, but were greeted by Basil and some fresh Narragansett Lobsters chilling out in the kitchen. 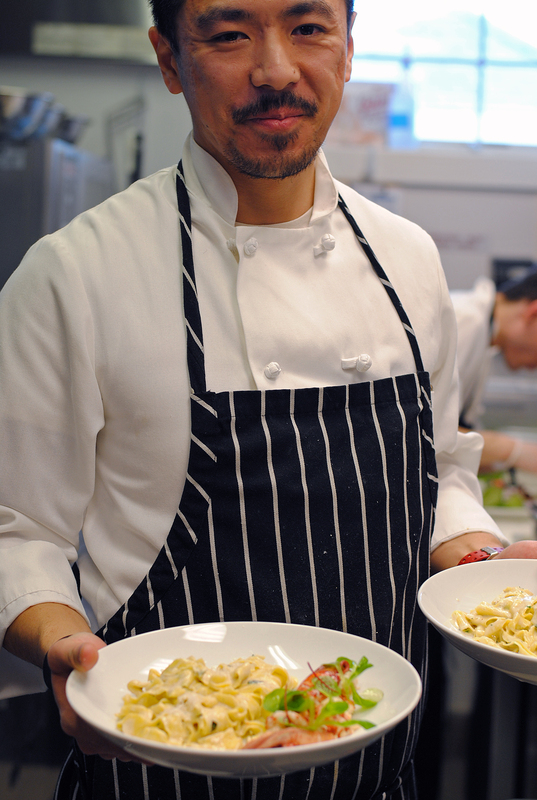 He let us know we were going to be making their creamy Narragansett Lobster Fettucini with homemade pasta, and my eyes lit up. 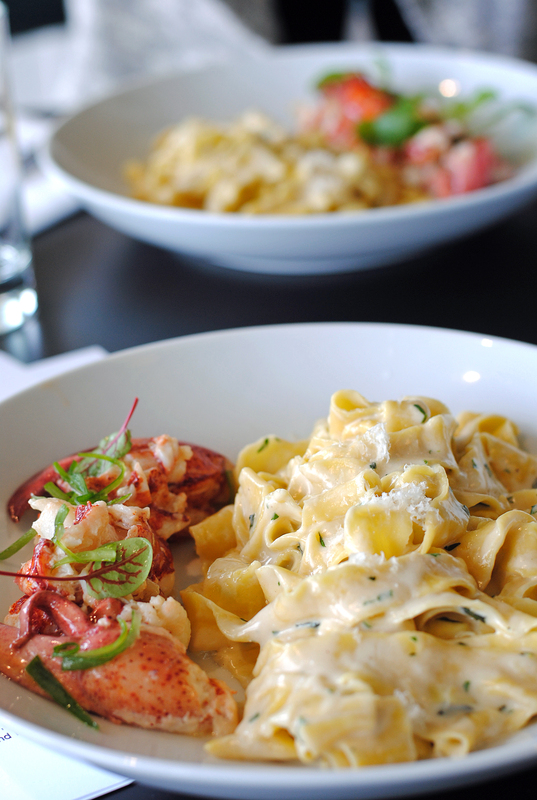 Give me all the cheesy, creamy pasta and top it off with some buttery fresh lobster plucked right out of the water down the street and I am a happy girl. Basil was awesome, he walked us through making the pasta by hand, we learned how to break down the lobsters (I’m going to be so much more confident ripping into a lobster this summer!) and went step by step through the recipe to create this gorgeous dish. It was ah-mazing, like I couldn’t stop eating it. And lucky us, he gave us the recipe to share with you so you can make it at home! 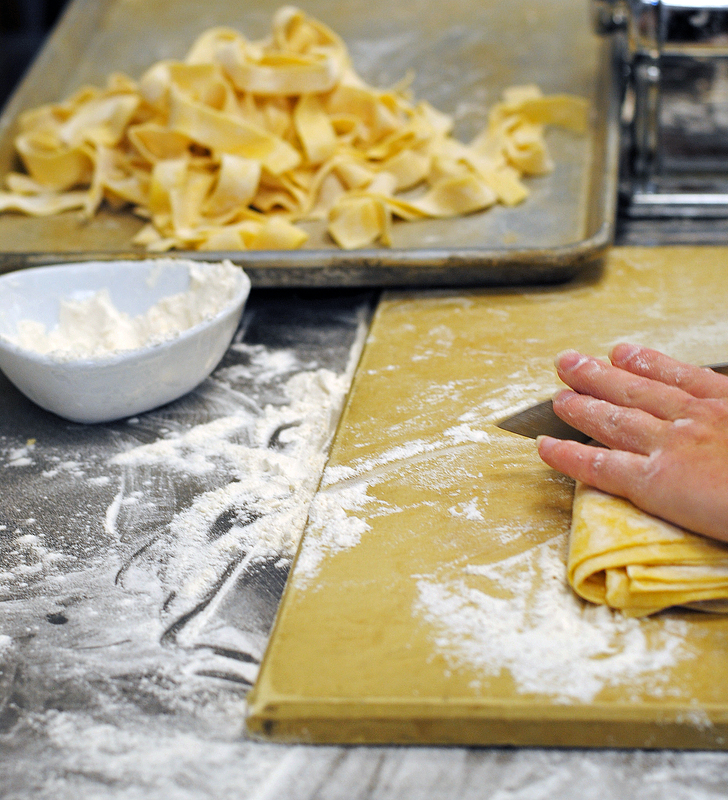 Start by making the fresh pasta. Place flour in a mixing bowl and form a well in the center. Mix egg yolk and whole egg together and pour into the well, slowly incorporate egg into flour until dough forms a ball. Knead dough for 5 minutes until it develops a velvety texture. Wrap in plastic and allow to rest for an hour before passing through a pasta roller to desired thickness. Cut to fettucini width. Next, steam the lobsters for 6 minutes, and then shock in ice water for 6 minutes. 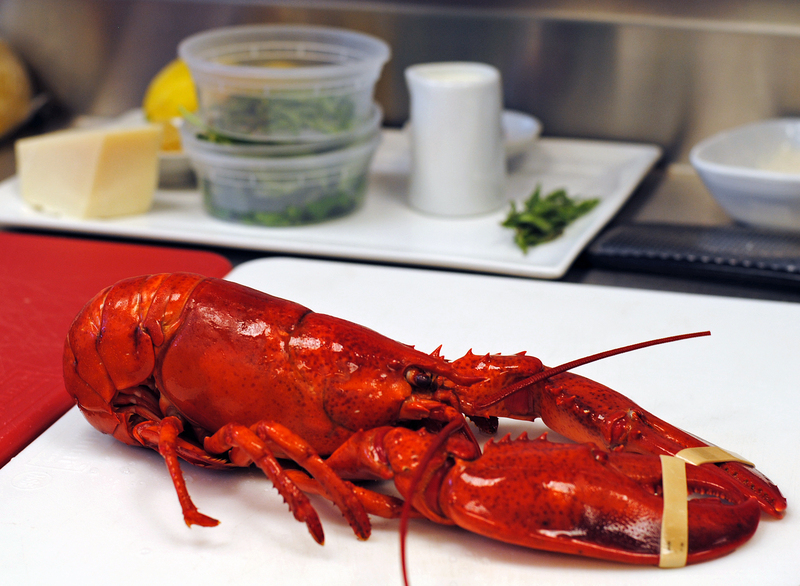 Remove shells and reserve for sauce, keep lobster chilled until ready to cook. 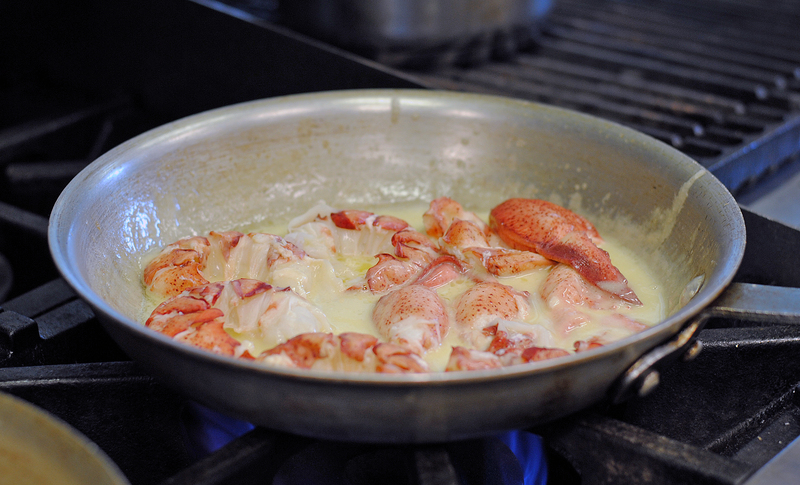 To create the sauce, sauté shells, shallot, garlic, and butter over medium-high heat. Deglaze the pot with white wine, scraping the bottom of the pan. Add a little water to cover the shells. Cook for 15 minutes and strain liquid to remove all shells. Add cream to liquid and reduce heat to a simmer, reduce the mixture until half the original volume. Add lemon juice, set, and parmesan over low heat, combine to melt. Mix in fresh herbs, salt and pepper off heat to taste. To assemble the dish, boil pasta for 3 minutes in salted water. 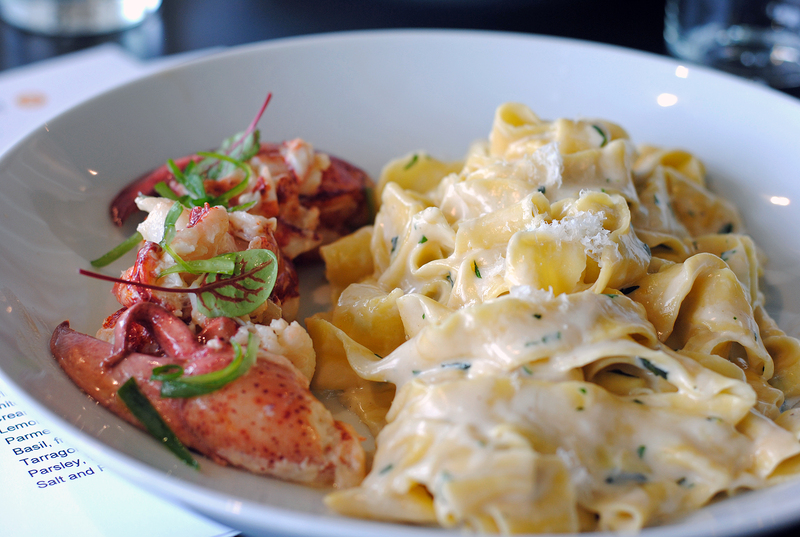 In a pan, heat lobster with 2 tablespoons of butter, once warmed through add lobster sauce and fettucini. Toss over heat until sauce coats the pasta and then plate, serving with more parmesan, and fresh herbs. Please note, Lark Hotels gifted us this experience, all opinions, photos, and pasta-consumption were my own! A Break at The Break. Loving Lately. 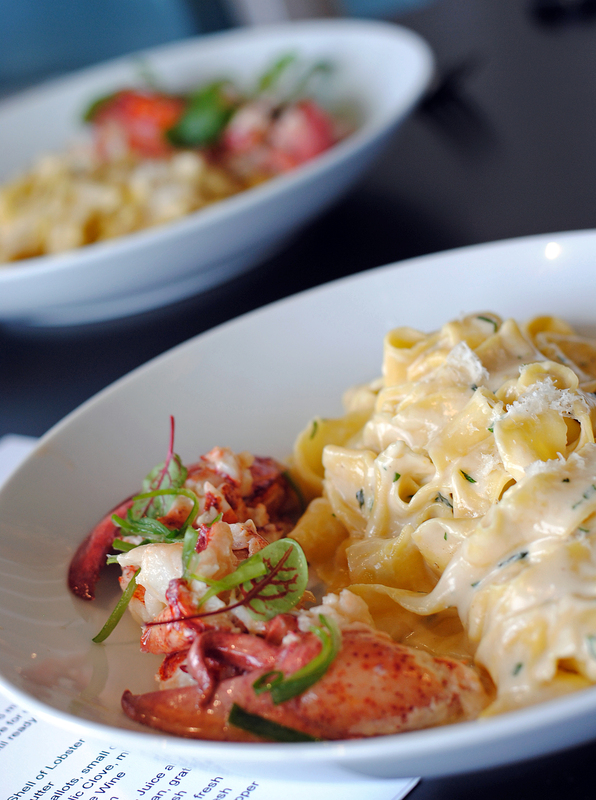 3 Responses to "Narragansett Lobster Fettucini." Oh wow, I want that right now. Looks AMAZING.